Sandi has been a stylist since 2006, and joined the S-kape team in 2012. Sandi’s commitment to education, color trends, and guest satisfaction has made her one of our highest in demand stylists with a passion for “Balayage” and color. 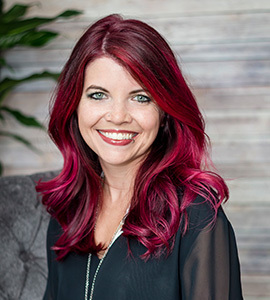 “I Love everything about doing hair, but especially color because the possibilities are endless.” When Sandi is not at the salon she is with her husband and children, coaching cheerleading, and out in their boat at the beach. Sandi serves guests on Monday 12-9, Tuesday and Wednesday 8:45-3:00, Thursday 3-9, and every other Sunday 9-3. She is and educator and works as a team with an apprentice.